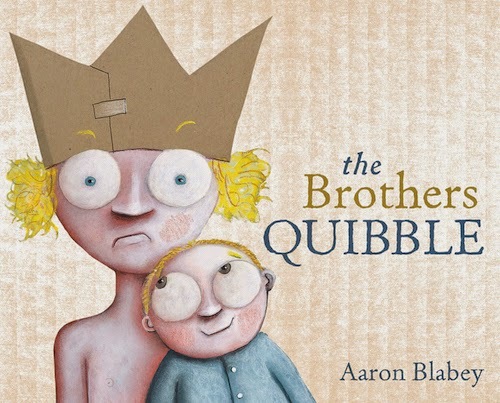 The Brothers Quibble is a children’s picture book, written and illustrated by Aaron Blabey and published by Penguin Books Australia, 2014. It has the distinction of being chosen as this year’s book for NSS: National Simultaneous Storytime. What is NSS? That’s the very special time when children across Australia will all listen to The Brothers Quibble being read aloud. In 2015 it’s at 11.00am on Wednesday 27 May. It’s hard when you’ve been the centre of Mum and Dad’s devotion, and a new baby arrives to steal the limelight. Spalding doesn’t take it well. He declares war and terrorises everyone. Mum and Dad retaliate by putting him in Time Out. Eventually, the baby grows, begins to talk, and idolises his big brother. He even stands up to him. Spalding realises there are real benefits to having a little brother. Blabey gives us a rollicking rhythm and excellent rhyme that children will respond to immediately. There’s lots of yelling in the book represented by huge capitals and contributing to the real drama, drama that’s enhanced by bold colours, body language and facial expressions. The Brothers Quibble begs for a second read-aloud, one where kids are not as swept up by Spalding’s war, and have the leisure to observe more, and ponder. I can certainly see why ALIA chose The Brothers Quibble for NSS. It’s perfect as a read-aloud: a family situation many kids will connect with, loads of humour, just the right amount of text per page, dynamic and varied illustrations, and a happy ending without sentimentality. There’s lots to explore visually and older kids will enjoy analysing what Blabey does in illustrations to underscore emotions and character perspectives. I think it’s the characters’ eyes children will remember most - it’s fascinating to look at the way they change and what this means. Even if you’re not participating in NSS, I hope you’ll seek out The Brothers Quibble for your home, school or public library. It’s a fine example of a children’s picture book where text, illustrations and book design work together seamlessly. More importantly, children will love it! Here are some activity suggestions you might like to use to accompany The Brothers Quibble in classrooms or at home.